New Delhi (Sputnik) — Indian Defense Minister Manohar Parrikar has arrived in Mauritius, where he will hand over two upgraded Cheetah helicopters to the nation's government during his three-day visit. 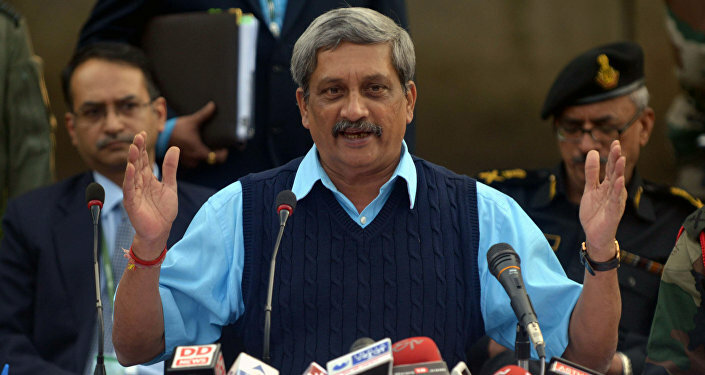 Sources say Parrikar will also commission an Indian-built fast patrol naval vessel for the country's coast guard. In September, India presented the country a 50+ meter fast patrol vessel. The ship is fitted with a 30mm Close Range Naval-91 gun, 12.7mm heavy machine guns and 7.62mm medium machine guns, as well as state-of-the-art navigation and communication equipment. Goa Shipyard, which manufactured the vessel, has claimed that vessel is capable of achieving a high speed of 35 knots. Parrikar is scheduled to meet with the Prime Minister and President of Mauritius during his three-day tour, during which he's expected to discuss a range of issues including furthering defense relations. Parrikar will tour an Indian Navy hydrographic survey ship stationed off the island nation's coast. Last year in March, Prime Minister Narendra Modi commissioned the sale of a 1,300 metric ton Indian-built naval patrol vessel, the ‘Barracuda', for the Mauritian National Coast Guard. This was the first strategic sale to Mauritius amid the growing presence of China in the Indian Ocean. Mauritius followed up this order with the purchase of eleven 14.5m fast interceptor boats and two fast attack crafts from Goa Shipyard. Mauritius is home to approximately 1.35 million people, the vast majority of whom live on the island of Mauritius, which controls several nearby islands. According to the US Central Intelligence Agency, ethnic Indians constitute 68 percent of the nation's population and 'creoles' of mixed African and Indian descent account for an additional 28 percent.